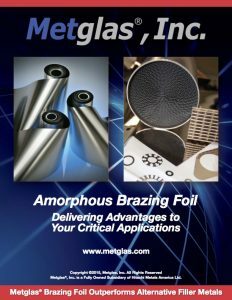 Metglas® Brazing Foils (MBF’s) and preforms provide extensive manufacturing and performance advantages over conventional metal joining materials. 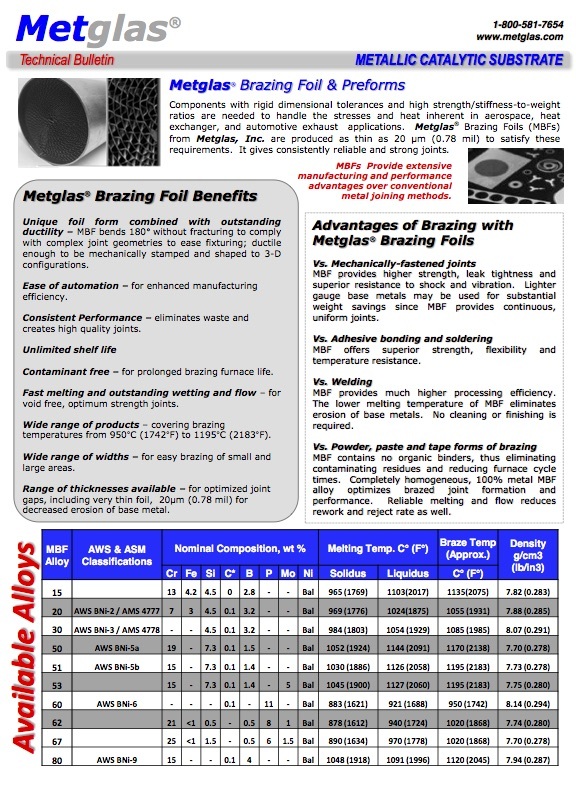 This unique form of amorphous nickel based brazing filler metal can substitute for previously used copper foil or nickel powder to braze stainless steel base metal. This amorphous nickel foil provides high strength and outstanding corrosion resistance of brazed joints. *Metglas Brazing Foils can be slit to specific widths and/or stamped into precise shapes for any application. 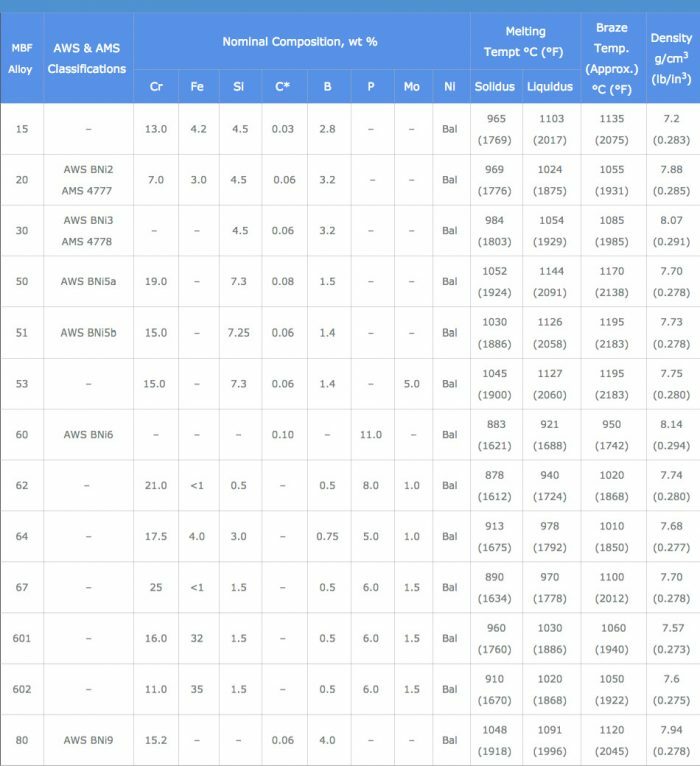 Quote AWS & AMS Classifications Nominal Composition, wt % Melting Tempt °C (°F) Braze Temp. Quote Nominal Composition, wt % Melting Tempt °C (°F) Braze Temp. 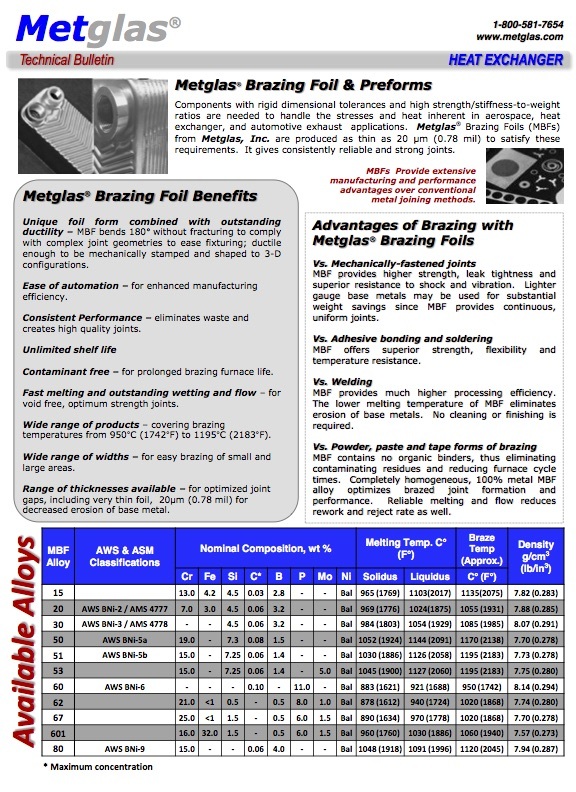 Metglas Brazing Foils (MBF’s) provide extensive manufacturing and performance advantages over conventional brittle brazing filler metals. Some of these advantages include a wide variety of widths and thickness for any type of project, corrosive resistance for long lasting stability and ease of installation. MBF’s bend 180° without fracturing to comply with complex joint geometries to ease placement fixturing; ductile enough to be mechanically stamped and shaped to three-dimensional configurations. 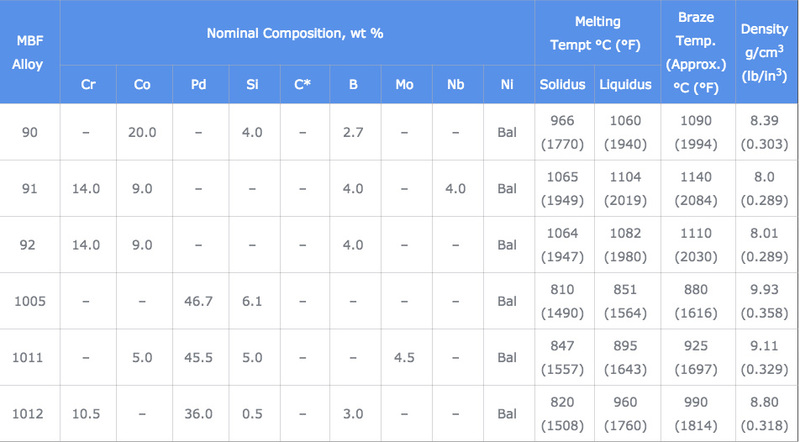 Covering melting temperatures from 950°C (1742°F) to 1195°C (2183°F). For prolonged brazing furnace life. For void-free, optimum strength joints. Covering but not limited to all stainless steels, super alloys, hard cemented carbides and low carbon steels. For easy brazing of small and large areas. For optimized joint gaps, including very thin foil, 20µm (0.78 mil) for decreased erosion of base metal. A virtually reject-free brazing operation in one heating cycle. Eliminates waste and creates high quality joints. MBF’s provides higher strength, leak tightness, and superior resistance to shock and vibration. Lighter gauge base metals may be used for substantial weight savings since MBF’s provide continuous, uniform joints. MBF’s provides much higher processing efficiency. The lower melting temperature of MBF’s eliminates melting of base metals. No joint cleaning or finishing is required. MBF’s offers superior strength, flexibility and temperature and oxidation resistance. MBF’s contains no organic binders, thus eliminating contaminating residues and reducing furnace cycle times. 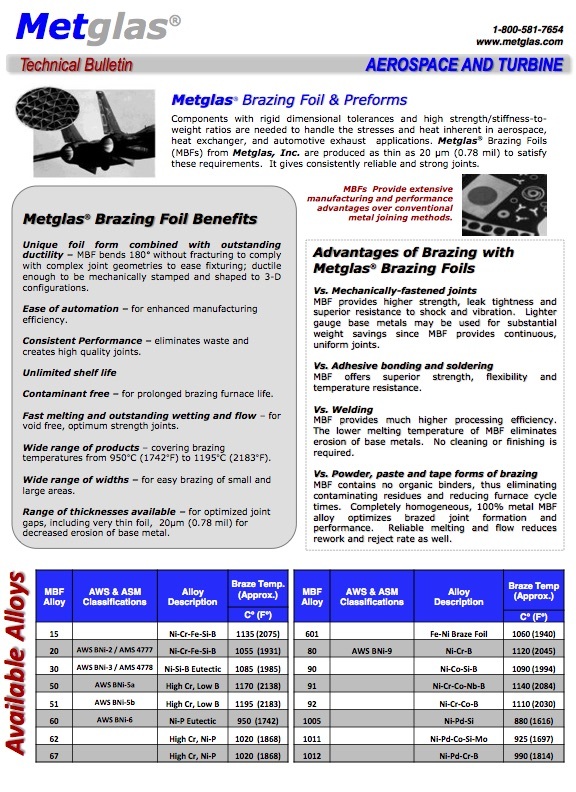 Completely homogeneous, 100% metal MBF’s alloy optimizes brazed joint formation and performance. Reliable melting and flow reduces rework and rejects too. 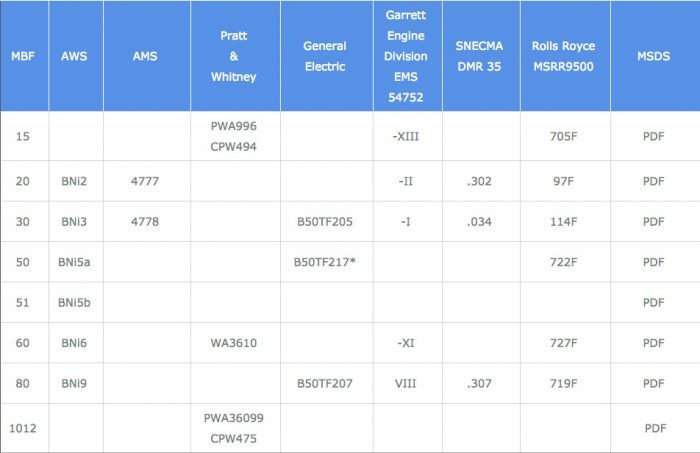 Metglas® Brazing Foils can be produced in a number of widths and thickness configurations, use this chart to determine if we have a standard size that will fit your application. 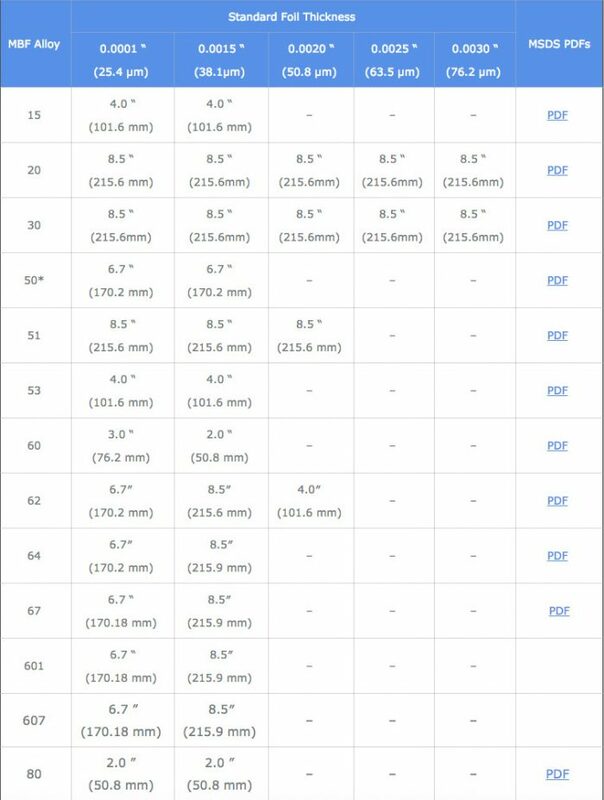 Widths and thicknesses not on this chart may be custom ordered. * Available at thickness dow to 0.00078″ (20 µm).